The past 30 years have brought enormous changes to the Chinese economy. In the late 1970s, the government started opening the economy to foreign investment and privatization. With these changes came sky-high economic growth – an average of 10% since 1980. And on Wednesday, the International Monetary Fund (IMF) released figures estimating that China is now the biggest economy in the world, surpassing the United States, though this achievement is up for debate. China’s incredible economic expansion has led the Chinese to be overwhelmingly happy with their economic situation and optimistic about their future, according to a 2014 survey conducted there by the Pew Research Center. But our polling has also shown an undercurrent of unease with conditions in China today, as many complain about inflation, inequality and corruption. A broad majority of Chinese (89%) think things are going well with their economy, making them the happiest on this measure compared with all other 43 countries surveyed this year. And they believe things will only get better. Eight-in-ten say the economy will continue to improve over the next 12 months. And 85% think the younger generation will be better off financially than their parents. This optimism stands in stark contrast to findings in Europe and the U.S., where widespread majorities believe their children will be worse off going forward. 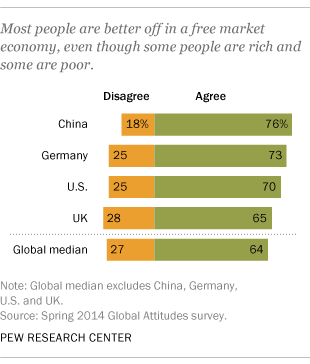 Despite the rosy picture in China, many Chinese complain about inequality (42% very big problem) and inflation (38%). More than four-in-ten (43%) say their government’s economic policies are to blame for the rich-poor gap in their nation, one of the higher percentages across all countries in the survey. The Chinese are also unhappy with the level of corruption they see. Last year, 53% said corrupt officials were a very big problem. And this year, 38% say that giving bribes is important for getting ahead in life, considerably higher than the global median of 16% (percentage saying 7, 8, 9 or 10 on 0-10 importance scale).